Upon hearing Geun Suk’s words, Shin Hye lifted her face from his chest, tilted her head and said, “Oppa, you got it?”. Geun Suk flicked her forehead and said , “Babo! Do you expect someone else to decode it. Tch!”. Geun Suk removed his hands from Shin Hye’s waist and walk towards the passenger’s seat. He stopped in front of the door, rested his elbow on the car roof, looked at Shin Hye, then tossed something towards her, “You drive. I’m tired”, then winked at Shin Hye. “Jinja! ?” Shin Hye looked at the keys and immediately opened the car door. Geun Suk looked at the girl sitting beside her, amazed at how bright her face is, “Is she ok now?”, he whispered to himself. Geun Suk’s eyes widened and screamed at Shin Hye, “Park Shin Hye”. The girl just looked at him and laughed heartily as she maneuvered Louis. Seeing that not a lot of people are passing at this side of Han, Geun Suk asked Shin Hye to stop and went down of the car. Shin Hye followed Geun Suk who settled himself at the back of Louis. She was walking while looking at the night sky, squinting her eyes, searching for those stars, ”Oppa, the sky is quite cloudy. I can’t see anything”, then she stumbled on something. Lucky, Geun Suk was fast enough to catch her before falling. “Go Mi Nam, last time i check, it was me who has night blindness and not you, dwaejji tokki!”, upon saying this, Geun Suk held her in the waist and lifted her up to the trunk of Rewi . “Woaaah!”, Shin Hye screamed upon feeling her feet not touching the ground. And once settled on Louis, she opened her eyes looked at Geun Suk who is standing between her legs and is looking intently at her. She tried to break the gaze and looked at the night sky, instead. Shin Hye looked at him, trying to see the direction where he is looking at. And upon looking back at him, he saw Geun Suk still not removing his eyes on her. Feeling kind of awkward, Shin Hye hit Geun Suk’s shoulders and said, “Yah, Oppa. Are we filming something? Can you..a… remove your eyes from me? I think i’m melting”, then she bit her lips. “Ani… Kyo… jinja!”, then, he pinched her nose. Geun Suk held Shin Hye’s hands and looked into her eyes, “Shin Hye, are you still worried …. about us? “Aisssh!”, she let go of his hands and was about to jump off the car when Geun Suk wrapped his arms on her waist. She was surprised at the sudden action that she automatically placed her hands against his shoulder, supporting herself not to slide down to him. With that said, Geun Suk slowly pulled Shin Hye to him, aiming for her lips. He can feel Shin Hye’s hands tensed on his shoulder. He ran his thumb on her cheeks, trying to relax her a bit. And upon sensing that she has calmed down, he moved his face an inch from her and said, “ Do not turn into dwaeji tokki, Park Shin Hye”. And just like in Minami Shineyo, GeunSuk deepened the kiss. He moved his right hand on the back of Shin Hye’s head pulling her closer to him, and snaked his left arm around her waist. He slowly brushed his lips against hers, waiting for her to follow his lead. Shin Hye hesitated at first, and with hands balled like a fist on his shoulder, Geun Suk, gently deepened the kiss, hoping that she will allow him to express his longing through this kiss. After five,ten seconds, he felt her hands opened up and was laid flat on his chest. Geun Suk, sensing that Shin Hye has let go and trusted him at “this” in this point, nibbled on her lips once more. Geun Suk slowly opened his eyes and seeing the neck line of Shin Hye being exposed by the sudden gush of wind.. knowing that this will definitely lead to something he won’t want to, closed his eyes once again and with all the courage that he can gather, slowed down his kiss until he’s just leaving peck on Shin Hye’s lips. “Saranghae”, surprised of her answer, Geun Suk held her tightly again and whispered, “Nado, Saranghae”. When their breathing has stabilized, Geun Suk looked at flushed Shin Hye and without a word, wrapped her legs on his waist and lifted her up from the trunk of Louis. Thinking that Geun Suk will just be bringing her down, Shin Hye was surprised when Geun Suk did not put her down, but instead carry her to the direction of the passenger seat. Geun Suk was just laughing at her sudden reaction, and with a grin on his face, he said, “Yah! I thought you’re on a diet”. Geun Suk earned a slap from Shin Hye as he brought her down on the passenger seat. Still not moving away from Shin Hye’s face, Geun Suk gave her lips a gentle kiss again before moving to the driver’s seat. 1* Shall We Ride Together? Shin Hye was spending her alone time along Han. She was sitting at one of the benches, admiring the night sky and, with earphone plugged into her ears, she doesn’t care on whatever is happening around her. As she looked deeper into it, it seems like the sky is pulling her closer, asking her not to remove her gaze. Feeling the danger of what it is asking for, Shin Hye averted her gaze and settled at the water gently passing along Han. She closely observed its movement, following its way intently without blinking and witness how the water take with it some of the leaves that had fallen from the trees nearby. 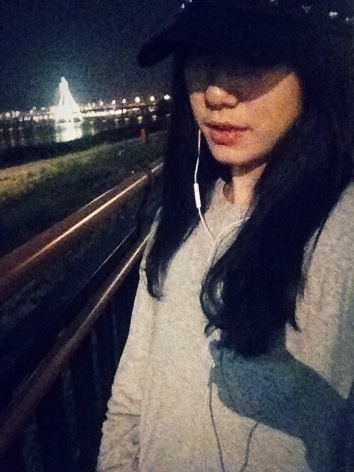 As she watched it move and pass under the bridge, Shin Hye let out a sigh. With the current turn of events and the things that are bound to happen in the next coming months, Shin Hye couldn’t help but be worried. Geun Suk will be leaving again for the series of Cri Shows. She is scheduled to start filming by the beginning of this month. The coming days will now be filled again by late-night kakao messages, phone calls in between breaks, gift and presents from every Cri-show location, and straight from the airport visits for every stop-over in Seoul. They were able to survive this for the last two years. Will they be able to do the same this year? “Aisssh!”, Shin Hye took out her iphone and send a message out of the blue… hoping that someone will read it… that a certain someone will know exactly what this heart is asking for. I want to brush everything off. Water take it all away… Start riding!! Thirty minutes and so have passed and still, no Geun Suk appeared at the Han. Knowing that Geun Suk might probably be with Kurt and Hong Ki, and thinking that Geun Suk might not be able to decode the message, Shin Hye just smiled and decided to head home. She was about to cross the street when a white Porsche stopped in front of her. The driver opened the car door and went down, “Ani. Jang Geun Suk”. “Oppa!” Shin Hye threw her arms around Geun Suk’s neck the moment he stepped out of Louis, faced buried on his chest. Surprised, Geun Suk took a step back and upon gaining his balance, wrapped his arms around Shin Hye’s waist and rested his head on the crook of her neck. They stayed in that position for who knows how long. Not minding the stares of the passersby, Geun Suk held on Shin Hye tightly, smiled and remembering her worries hidden on that message, he whispered to her ear, “Shall we ride together?”.